Adene Thompson Steele (’38) remembers the Depression and life lessons learned at North Texas. 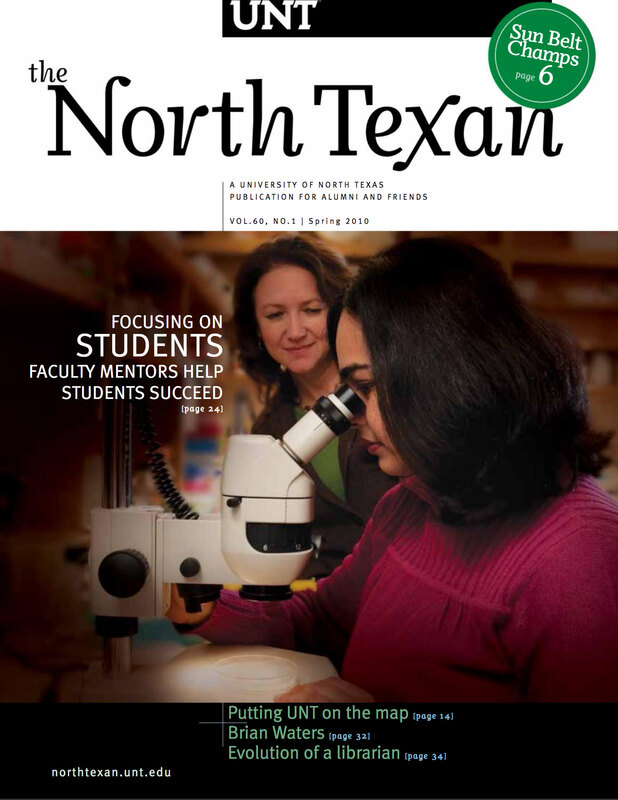 For 26 years, I watched UNT grow and improve while I served as a senior administrator. Campus became a winter wonderland for building snowmen and sledding. Graduates in library or information science have become leaders of the information generation. UNT’s One O’Clock Lab Band earns two Grammy nominations, bringing its total to six. 97-year-old San Antonio man receives a long-awaited degree from UNT. Kansas City Chiefs' four-time NFL Pro Bowler recognized for his generosity and support. Multi-award winning photojournalist Chip Somodevilla (’95) captures history through his images. UNT hosts members of the media who covered The Texas Debates: The Race for Governor. Grads wear biodegradable gowns, Grammy nods, top 10 finalists in the Miss American Pageant. The UNT community gave big this semester to help those in need, globally and locally. UNT claims its second Sun Belt Conference Tournament title in four years. Associate professor receives the Presidential Early Career Awards for Scientists and Engineers. English assistant professor produces first full-length study of Jacobean nuptial performance. Nada M. Shabout, associate professor of art history, co-edits new in-depth survey of Arab art. Cornel West, Princeton professor and civil rights activist, discussed social justice. Inauguration was a mini-reunion of UNT’s higher education doctoral program. How can you sculpt a landscape that saves water? UNT partnerships with institutions in China and India will foster joint research activities. Mean Green game day events will be bigger and better in new alumni pavilion. Rock and roll legend Roy Orbison was honored posthumously on the Hollywood Walk of Fame. First exhibition of children’s clothing presented by the Texas Fashion Collection. Two UNT alumni serve country overseas. Midlake releases new CD The Courage of Others. Students in 3-D design course wrapped bodies in tape for their final project. The life and work of alumna and acclaimed Texas-based contextual artist is subject of new book. Yosemite National Park’s wilderness region was the summer studio for two photographer alumni. Assistant professor of fashion design wins honor in Texas Make It With Wool competition. Guest choreographer Bebe Miller gives free public lecture at UNT.